This document adds three new children to Rev. Richard JACKSON (1602-1681) and Dorothy OTWAY of Kirby Lonsdale: Nathaniel Jackson; Hannah JACKSON and Dorothy JACKSON. This Rev. JACKSON was the father of a number of JACKSONs who emigrated to Ireland in the mid-1600s. I have updated my Rootsweb family tree to include these new additions. Thanks to Iam MacRae May 26, 2013. NOTE: Included in this document was also a rendering of the JACKSON-BERESFORD combined family crest. On the JACKSON side of the crest, were three birds, as one would expect in any crest that had to do with the JACKSONs of Coleraine. William Jackson of Coleraine in the County of Londonderry first Son of the reverend Richard Jackson, Minister of Whittington, in Lancashire, which Richard Jackson had to wife Dorothy Otway Sister to Sir John Otway by whom he had issue surviving at the time of the said William’s death, three sons and two daughters [?] John, Nathaniel and Samuell. Hannah married to Major Bond, and Dorothy married to Thomas Walker of [Leeds?] Merchant. The first mentioned William Jackson took to his first wife Elizabeth daugtr of Sr Thomas Staples of the County of Derry Bart by whom he had issue Six Children all died. He took to his second wife SusAnna, daughter of Sr Tristram [?] Beresford of Coleraine aforesaid Bart, by whom he left issue, Nine Children [viz?] William, Richard, Beresford, John, Thomas, Samuel, Otway, Rose and Jane. The said firstmentioned William departed this mortall life at Coleraine afforesaid the twenty-fourth day of July one thousand six hundred eighty and eight, and was inter’d the one and thirteenth day of the same month in the Parish Church of Coleraine. The truth of the premises is testified by the Subscription of the above names Samuel Jackson brother of the Defunct, who returned this Certificate to be recorded in the Office of Sir Richard Carney Knt Ulster King of Arms of all Ireland the 22nd day of September Anno Domini 1688. This may be the same document that is also at: Genealogical Office. MS 96; p.79. 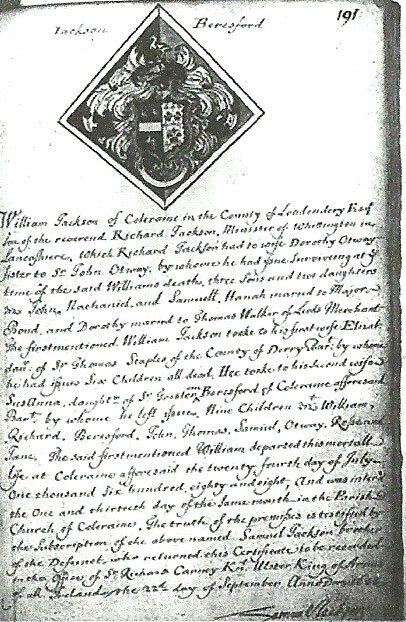 Funeral certificate of William Jackson of Coleraine, Co. Londonderry died July 24, 1688. I have not seen this version. William JACKSON (1628-1688) of Coleraine. See: The Silver Bowl Rootsweb Tree. · Coleraine, County Londonderry; fun. Established 1688, William Jackson, son of Rev. Richard Jackson of Whittington County Lancaster by Dorothy Otway wife, daughter of Sir John Otway knight of Ingmire. Gu a fess betw. Three cormorants ar.SOURCE: The General Armory of England, Scotland, Ireland and Wales.Vol II. Bernard Burke. NOTE: Burke's made an error in attributing John OTWAY as Dorothy's father. Thanks to Jan Waugh for noticing. Dorothy OTWAY (1605 bet 1632-1641) NOTE: She was actually a half-sister of Sir. John OTWAY. Parents: Roger OTWAY and Anne HEBBLETHWAITE. John JACKSON (1630-?) On a site by John Cameron Ward, 8 children were ascribed to him. Since he would have been 8 years old at the time of the first child, I have discounted most of these. The last one is a possibility: John JACKSON Christening: 8 JUL 1654, Kirby Lonsdale,Westmorland, England. Anne JACKSON, wife of Adam DOWNING (1666-1719) is also said to be a child of his. DOWING family research has compelling evidence that the wife of Adam DOWNING was Ann JACKSON, daughter of John JACKSON -not Margaret, daughter of Thomas as is alleged in some of the genealogies such as Burkes. This information is on the Downing family vault at St Tida’s Church, Bellaghy Co. Londonderry. In his will, Adam Downing referred to his wife as Ann. NOTE: The John JACKSON (1666-?) – if he is a son of the John JACKSON (1630) is a possible father for the Daniel and Sarah JACKSON who were minors at the time of their father’s death, when their estate in the Parish of Creggan Armagh was held in trust by John BALL. Nathaniel JACKSON. Now included in The Silver Bowl Rootsweb Tree.. He died before the 1705 will of his brother Samuel JACKSON. .. son of my dead brother Nathanial of Leeds in Yorkshire I have not tracked him down, but of considerable interest is: Estate of Jackson family of Burley, Leeds: 1/4 messuage in Birkby; house, garden, orchard and 12 closes (59a. ), Keddingley (Nathaniel Jackson; Eliz. Jackson; Benj. Wade). National Archives, UK. D4762/4 1690-c1730. They are held at the Gloucestershire Archives: archives@gloucestershire.gov.uk and I have contacted them to order the document. Samuel JACKSON (-1705). Most of what I know about his was gleaned from notes done by Tenison Arthur Groves of the 1705 will of Samuel JACKSON. He served as a Member of Irish Parliament representing Coleraine. Hannah JACKSON. Now included in The Silver Bowl Rootsweb Tree..
 Major BOND. At present I know nothing of him. Dorothy JACKSON Not previously included in The Silver Bowl Rootsweb Tree..
 Thomas WALKER. Is it possible that he was a brother of the George WALKER of Siege of Derry fame? Leeds is in West Yorkshire. I would suspect that learning more about Nathaniel JACKSON will lead to learning more about Thomas WALKER. Sir Thomas STAPLES (-1653) Thomas STAPLES had originally come from Yate Court, near Bristol in Southwestern England, in about 1610 as part of the plantation of Ulster. He settled in the town of Moneymore (then being constructed as part of the terms of the Plantation Grant to the Worshipful Company of Drapers [NOTE: Same as the JACKSONs] who had been granted large swathes of the new County in 1611) in County Londonderry and his stone house is marked in a map of 1635as in the centre of the town beside the Market Cross. Sir Tristram BERESFORD (-1673) for more detail see: Wikipedia as well as The Silver Bowl Rootsweb Tree..
Probate to Wm saving right of Elizabeth. Beresford JACKSON (aft 1688-1730) His death date is based on his will probate date. It could be earlier. John JACKSON (aft 1688-) According to Coleraine in Bygone Centuries he died young. This is possible. It is also possible that he was the John JACKSON who was the deceased father of minors Daniel and Sarah who were left lands in Creggan Parish in trust with John BALL. Thomas JACKSON (1680-1750). In 1727, he served as a Member of Irish Parliament representing Coleraine. It is possible that he had a 2nd wife named Anne. Rose JACKSON (aft 1668-Feb 1738) she married Thomas BUNBURY (1673-1743). They had two sons. Jane JACKSON (aft 1668-1744) She married Henry WRAY (-1737) of Castlewray, Co. Donegal. They had 2 sons & 2 daughters.